Oracle Database is the preferred location platform of leading geographic information systems (GIS) and location-based services (LBS) vendors. This list includes Technology Partners delivering GIS and LBS technologies using Oracle Spatial and Graph and Oracle Fusion Middleware Mapviewer. CISS TDI GmbH Services focus on database design and implementation, loading and exporting GIS-data using their own product CITRA, and connecting the database with GIS in a heterogeneous environment. 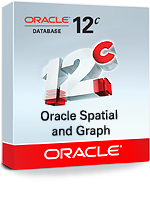 Delasoft Spatial Component Administration Tool for Oracle Spatial Enterprise Databases provides an easy way to manage dynamic segmentation and LRS functions. It also provides validation and user reports. Galdos Systems Inc. A software products and services company that delivers enterprise location-enabled information management solutions with a concentration in the Oil & Gas, Aviation and Government sectors. Galdos INdicio™ Registry Platform is a complete platform for developing registries and registry solutions requiring strong data governance features. With INdicio you can create web services for storing, and managing complex geographic and geographically related information such as that associated with physical assets. GeoTools Project An open-source, Java-based GIS toolkit for developing solutions, that are compliant with Open Geospatial Consortium and other interoperability standards.